After I picked up some groceries, I drove to the gas station, located in the same parking lot. I love the convenience big chain grocery stores provide by also selling gas. When I pulled up, I noticed an older lady (around 78 yrs old) standing behind her car, while a younger ‘older’ man filled the car with gas. He was the gas station attendant, and he was helping this older woman. I got out of my car, and I started filling my car with gas. I heard the dialogue between this man and woman. She was telling the man about the car, which she and her husband bought 10yrs ago, with the hope of taking it on long trips. Then she said, “But then, he had a stroke and that was it. He had his own business, too; and, it was doing really well.” As I stood by the car, trying to be discreet with my eavesdropping, the woman said, “She can pump her own gas.” ACK! I was caught! I smiled to the woman. Then I heard her to yell to someone across from me, “He’ll be with you in a minute. He’s helping me pump the gas.” I looked over in the direction she was speaking, and I noticed a guy, probably in his late 30s, waiting for the gas station attendant to return to the cashier window. I chuckled a little and said, “How rude.” She smiled back and said, “Rude and hateful. Just hateful.” And, we both laughed. I enjoy moments like the one I had at the gas station. And, I enjoy the friendliness and generosity of good-hearted people. 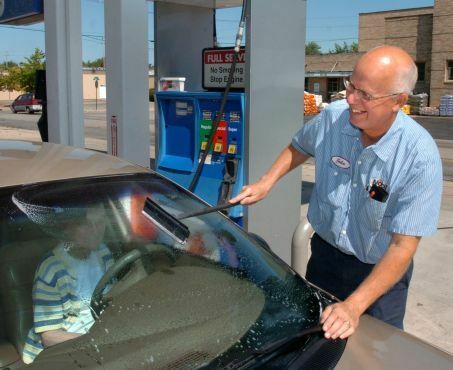 There was a time when a gas station attendant would always greet a driver at the gas pump. Gradually, the full-service gas station went to the wayside, though not before giving the driver a choice between self-service and full-service. I remember those days, and I am certain the guy waiting at the cashier window remembers those days. But, nowadays, I know there are more people that don’t recall the days of the gas station attendant. And, those younger folks would probably not be as patient or kind as the guy waiting for the attendant. I am glad the attendant was willing to come out of his ‘box’ and help this woman. I wish more people would come out of their ‘box’ and help others, too. Or, if people prefer to stay in their ‘box’, perhaps they could be patient and kind while someone else lends a hand.